James Cohan Gallery is pleased to present conexhibitions exhibitions, Bill Viola: The World of Appearances, and Mandalas: South Asian Cosmic Diagrams. These two exhibitions will be on view through May 3, 2003. A fluid and contemplative event unfolds in Bill Viola's large-scale video installation, The World of Appearances, 2000. An image of a human figure is projected onto two large screens of identical size (12 x 7 feet) in a 90-degree configuration, one mounted to the wall and the other to the floor. A glass panel, identical in size, is cantilevered at a 45-degree angle between the two screens. 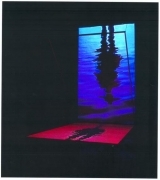 The image sequence shows a man at the edge of a pool of water whose reflection is seen in the surface. After a long pause, he falls forward in an explosive, turbulent splash. The figure submerges and disappears as the water continues to undulate, producing abstract patterns of color and form. The action is seen in extreme slow motion and repeated in varying sequences, always with the idea of contrasting reflection and reality. The relatively simple configuration of screens and glass panel yields an involved interplay between image and reflection, object and illusion, self and self-image. Everything is in motion. Everything is a reflection of itself. Nothing is what it appears to be. The human being, as both subject and object, is at the center of this interaction. It is the direct action of the figure, and the resulting shattering of the image surface, that becomes the only substantial, verifying aspect of the world of appearances. Conceptually, The World of Appearances for Viola finds its roots in Tantric Buddhism. Buddhist teachings lead one to the belief that there is not a single reality, but rather a constant flow of illusions. While the material world does exist for the Buddhist, it is fluid, transitory and illusory like a dream or a mirage. 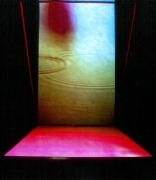 The meditative and prismatic quality of the video installation alludes to the same spirit in which the Buddhist practitioner seeks to attain a "clear light" state of Buddhahood. 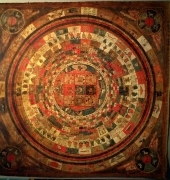 The conexhibitions exhibition is a selection of traditional South Asian cosmic diagrams from sixteenth to eighteenth century Tibet. 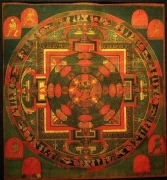 Traditionally known as mandalas (from the Sanskrit, meaning matrix), these intricate symbolic paintings, referred to as Thangkas, may be understood as diagrams of sacred spaces and events. Each can be read as an aerial, multi-dimensional view with a central deity figure surrounded by concentric layers of retinue or attendant deities, offerings, and symbolic attributes. Time, space and energy are encoded in their highly organized layers of detail. 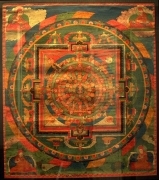 Customarily painted with mineral colors on sized fabric, Thangka paintings displaying mandalas are used for contemplation in meditation practices. Elaborate and dense with symbolic significance, they are inspired visualizations for a devotee's practice. The very process of painting them is an act of devotion. The seed of total enlightenment is said to exist within the minds of all sentient beings. Mandala images are expressions of this fundamental, shared experience. As such, each offer a glimpse into a world of unconditioned perception inspired by bliss.